Last month, a colleague and I attended the Bank Innovation 2017 conference hosted by Royal Media in San Jose, Calif. A consistent theme in presentations was FinTech (financial technology) disruption. As I sat with fellow technology vendors, banking technologists and strategists I posed the question to many of the people I interacted with to gauge what everyone thought—Is there disruption in the Financial Services industry from FinTech? Disruption: It's all the buzz these days, and even more prevalent in the financial sector. In financial services, these disruptors are known as FinTechs. FinTechs are defined by The Economist as, "New entrants that use internet-based and mobile technologies to create new or superior banking products. FinTech firms range from startups to the bank product offerings of large tech firms, such as Google or Apple." Many have described the disruption phenomenon. I'm surely not the first and won't be the last to debate whether its disruption or innovation. 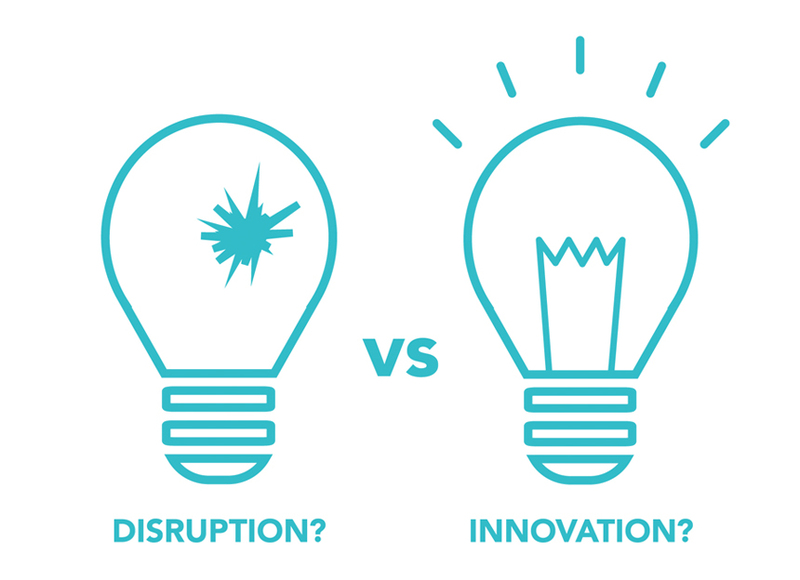 As I pondered the disruption question, I looked at two of the world’s most famous Harvard Business School professors who have battled against each other on this topic: Strategy guru Michael Porter, who professes "sustainable innovation," and innovation sage Clay Christensen, who favors the term "disruptive innovation." Having worked in technology within the financial services arena for nearly 20 years, my experience tells me the term 'disruption' is just a new way of saying competition. FinTechs are looking to take market share away from financial institutions (FIs) and provide more options to consumers and commercial customers that are either less expensive, faster, more convenient, more efficient, outside traditional banking channels, a more personalized experience, or all of the above. Is this truly disruption? I have to agree with Michael Porter in that this is not disruption, but healthy competition, which spurs innovation by all competitors in the space, new or old. Will the real FinTech companies please stand up? In late 2016, a pivot toward partnership, rather than competition, began to flourish between FinTech startups and FIs. This shift suggests that most FinTech startups are actually enterprise software companies that provide new, innovative ways to do banking in the digital age. Even funnier is the fact is that many of these FinTech companies are really the FIs we already use. Heck, most of these so called FinTechs have been around for more than 160 years: TD bank, 150+ years; Wells Fargo, 164+ years; PNC, 171 years; Bank of Montreal (BMO), 200 years; JP Morgan Chase (Chase), 200 years; Citibank (Citi), 204+ years; Bank of America (BoA), 225 years. All have recognized that many of their customer and product systems are decades old and are in deep need of a refreshing. To do this, they’re exploring investments in FinTech and, in the process, redeveloping themselves from the outside in. This begs the question: Is a new or innovative approach to traditional banking transactions disruptive, or is this just an update of a bank's legacy systems to remain competitive and relevant in the millennial age? As customers, we should probably be thankful that FIs are getting current and driving profit margins down, as it will help drive efficiency and meet the needs of retail and commercial customers. Banks bring wisdom, experience and scale. However, FIs don't always share the initial goal of FinTechs—real change for the benefit of the customer. This to me is still not disruption, as true disruption causes much more collapse of industry stalwarts, as they can no longer keep up with traditional business models. Think of what Amazon has done to traditional shopping malls. That's disruption. The financial services industry is a toweringly large vertical. FIs have been in business for a long time and are immensely profitable (in the billions). However, business opportunities remain. New entrants can service customers larger institutions would prefer not to: Non-bankable, high-risk consumers and businesses, among others. If new entrants provide a better customer experience at a lower cost in a faster, more profitable and more convenient way, they will steal market share from the big players. Mobile-only banks that don't have a brick-and-mortar presence. You can only add money or use your money through online transfers. Mobile-only is the model. Digital wallets: Do we need to say more than Apple Pay, Google Wallet, Android Pay, Samsung Pay, Microsoft Wallet and bank wallets such as Chase Pay? Peer-to-peer payments without the involvement of a "middle-man" (typically a bank) for Consumer-to-Consumer, Consumer-to-Business and Business-to-Business transactions. FinTechs in this space eliminate or hide the middleman entirely, creating frictionless payments. "Robo-advisers," machine learning, data analytics and robots that use data and machine learning to automatically provide investment advice and planning for users in a self-service model. Virtual Currencies: Bitcoin, Plenty and others. Local Currencies: Ithaca's 'Hours,' Pittsboro's 'Plenty,' Massachusetts' 'BerkShares,' and others. Blockchain: Northern Trust Private Equity Management System, based on Blockchain; Canadian Banks Concierge ID leveraging SecureKey's IBM Hyper Ledger Blockchain stack, among other examples. We can see from the above that FinTechs are changing the usual methods of traditional banking and forcing traditional banks to do the same. FinTechs that have made traction are those involved in digitization: digital wallets, mobile-only banks, and crowdfunding. These areas have the fewest regulatory obligations. Other success stories are those that pass the highest risk to the customer through costs, fees, or high-risk instruments or customer pools (Prosper, LendingClub). 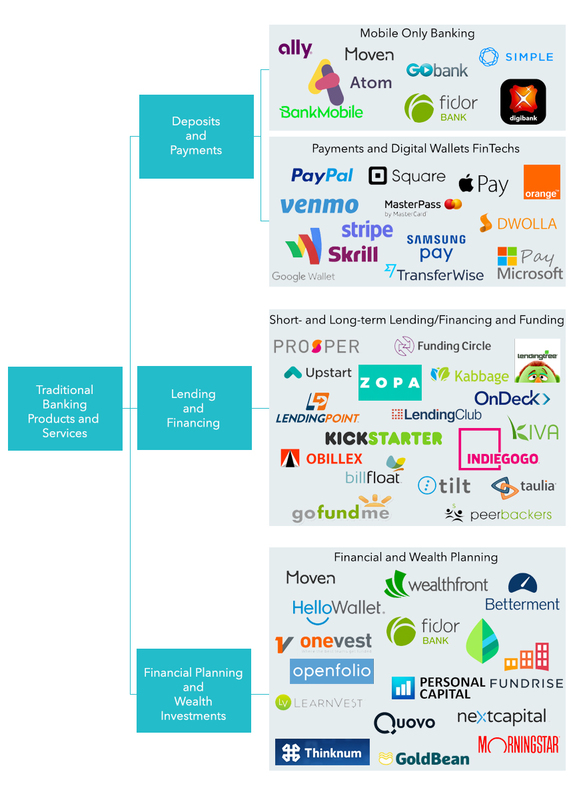 The above illustration also only shows a smattering of the total FinTechs that are currently operating. The number of startups around the world is far greater and increases daily. The Financial Services sector in the U.S. alone is estimated to have a $7 trillion market capitalization. Just think about that! What is the potential for FinTechs to profit in this market? The sector is ripe for competition, but are any of these products and services really disruptive? At face value, the products and services are fairly traditional. What differentiates these products is that they’re far more accessible. FinTechs will continue to create a buzz. The innovation—enacted by FinTech startups and the stalwarts of the industry alike—will ultimately benefit the end-user of these products and services in the financial sector. Banks are still the most important power in financial markets and will continue to control the core banking functions in most countries. Governmental regulations are too complex and are not keeping pace to match the industry changes. This is exacerbated by the number of layers: Any rule changes must occur with government bodies in every country, state, county, local municipality, thus slowing market entry. FinTech products don’t have the brand recognition, popularity and customer trust that current bank products enjoy. Therefore, the “newbies” don't have the same consumer power that banks do to sway industry trends. Customers trust their banks begrudgingly, but some trust still exists. It will take time for those same bank customers to build enough trust in FinTechs to share their financial data and make a switch. FinTech technical solutions are complex and require experienced development teams that work in agile methodologies to meet the quick pace of change required. Look at Blockchain technologies' slow start as an example. For true disruption to occur, the barriers to entry need to be eliminated or severely reduced. Even with the aforementioned success stories, FinTechs should be cautiously optimistic. I don't believe this will stop FinTechs. This gives existing industry players a major advantage. Existing FIs already operate under heavy regulation, have lobbyists and ways to ensure that they can continue to operate at the top of the food chain. Alternatively, the "newbies" will have success in the retail and consumer space, as most banks find this area as a necessary evil of doing business, and it is the most expensive cost for them to service. FinTechs that aim for new, efficient technology and digitization quicker to market than traditional FIs will have the highest success in customer acquisition, while taking profit margins down for the entire financial sector. Looking into the crystal ball, FIs know they need to innovate to stay competitive. They can't do this within their own legacy organizations without significant culture change, application development methodology changes and project-versus-product financing models. Enterprise software companies that control core banking or extension systems (Fiserv, FIS Global, Salesforce.com, Microsoft, Oracle, SAP, ACI) have hooks into the major FIs will continue to control traditional banking. FIs are creating innovation divisions or investing in startups who they will then acquire to remain competitive. These strategies will help banks stay relevant, and this behavior created a pivot. Many FinTechs are becoming bank partners or new enterprise software companies that license their products to a multitude of FIs, expanding the channels these businesses use to serve their customers. I can conclude that it's not disruption, but sustainable innovation (as Porter put it) that creates competitive innovation by all in the sector. In the end, this is good for the customer. Disruption, no. Strategic intent with innovation, yes.